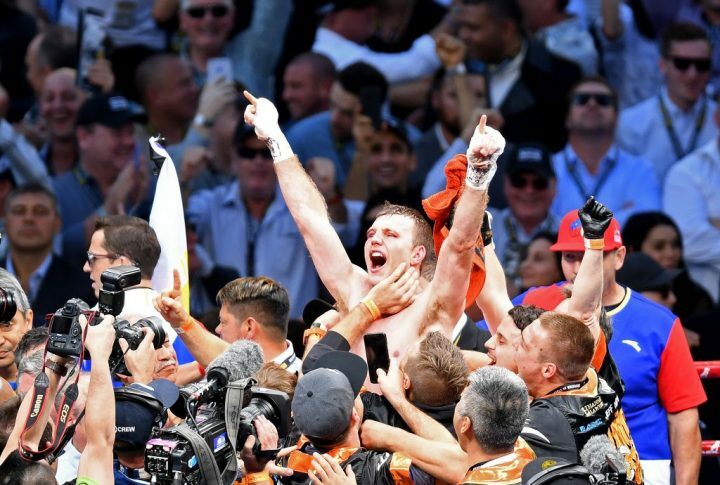 By Scott Gilfoid: Kell Brook has been offered a fight against former WBO welterweight champion Jeff Horn, who is willing to come to England and face him in May if he agrees to the fight. It’s a risky match-up for Brook, who seems to only want to fight Amir Khan. Brook (38-2, 26 KOs) had been counting on fighting Amir ‘King’ Khan in April or May in a big stadium fight in the UK on Sky Box Office, but that fight won’t be happening. If the Brook vs. Horn fight gets made, it’s very likely that Matchroom Boxing promoter Eddie Hearn will put it on Sky Box Office PPV. Brook-Horn is not a PPV worthy fight, but it’ll likely wind up on Sky pay-per-view just the same Brook was supposed to be putting the 154 pound division on notice when he moved up to the weight class last year, but he’s still not fought the talented 154 lb fighters like Jarrett Hurt, and it’s looking like he never will. Instead of Brook fighting Hurd, he’s likely going to fight Horn, Liam Smith and then Amir Khan before retiring. Horn is a good pressure fighter with size, decent power, youth and Olympic experience. Horn’s pressure might be too much for Brook. He could brake Kell like Errol Spence Jr. and Gennady Golovkin both did in shattering his eye sockets in the process of stopping him. Khan, 32, will instead be challenging World Boxing Organization 147 pound champion Terence Crawford on April 20 on ESPN PPV, if the fight deal can be finalized. Brook is eventually going to get his fight against Khan at some point in the future, possibly in either late 2019 or early 2020, but he’ll likely be coming off of a knockout loss to Crawford when they do meet up. If Brook fights Jeff Horn or Liam Smith, he might lose to one or both of those guys. Brook clearly isn’t cut out for the 154 lb weight class. Without his size advantage that he had his entire career at welterweight, Brook isn’t the same guy in competing with guys his own size at junior middleweight or at middleweight. Brook was the same size as former middleweight champion Gennady Golovkin, but he was taken out in five rounds by him in six rounds. 2012 Olympian Horn recently moved up to middleweight and stopped 43-year-old former two-time WBA super middleweight champion Anthony Mundine (48-9, 28 KOs) in the first round last year on November 30 in Brisbane, Australia. Horn looked good in weighing in at 155 3/4 pounds in his first fight at middleweight. Always big for the welterweight division, Horn seems more suited at fighting at junior middleweight or middleweight. He could be a handful for the 32-year-old Brook, who might not be up to the task. Brook doesn’t want to lose to anyone and mess up his big money fight against Khan later this year. “I’ve got a text into Eddie at the moment, my matchmaker has an email and a phone call into Eddie, we love this fight, to have Jeff Horn fight Kell Brook,” Horn’s promoter Dean Lonergan said to skysports.com. Brook will likely be facing former WBO 154 pound champion Liam ‘Beefy’ Smith (26-2-1, 14 KOs) next, not Horn. Brook’s promoter Eddie Hearn of Matchroom Boxing signed the 30-year-old Liam Smith last week to his stable for a three-fight deal. It’s widely believed that the purpose of Hearn signing Smith was to match him up with Brook in a UK bash, either before or after the Khan-Brook fight. However, with Khan choosing to fight Crawford next in April, it makes it important for Hearn to find an opponent for Brook fight next while he waits. That could mean that the Liverpool native Smith will be next for Brook unless Hearn decides to match him up with Horn. That’s a risky fight for Brook. Actually, both fights are risky ones, as Brook looked poor, old and beatable in his last fight against Australian fringe contender Michael Zerafa in their fight last month on December 8 in Sheffield, UK. Brook won the fight by a 12 round unanimous decision by the scores 118-110, 119-109 and 117-111. The fight looked closer than the scores, and it was a hard one for Brook. The much younger 26-year-old Brook was able to give him problems with his youth and natural size. “If you were going to do it, you would definitely go to England, because the boxing market up there is on fire, and Kell Brook in Sheffield, which is where he comes from, you’re definitely going to be filling a stadium wherever you go,” Lonergan said. If it ends with three more fights for Brook against Liam Smith, Jeff Horn and Khan, it would be a disappointing career for Kell. The only real big win of Brook’s career was his victory over Shawn Porter in 2014, and even that one was kind of questionable, because all Kell did was hold all night long. Brook gamed the system by giving forward each time he’d throw a punch and then grab Porter to keep him from throwing punches. The performance by Brook was a textbook case of how to spoil for 12 rounds and get away with it without being penalized or disqualified. It was lucky for Brook that the referee that was working that fight, Pat Russell, didn’t take points off for his blatant holding, because that was mostly all Kell was doing in the fight. It was a very ugly performance by Brook. If you compare how Brook fought against Porter to how he performed against Kevin Bizier, Jo Jo Dan, Frankie Gavin and Alvaro Robles, it was like looking at two different fighters. Brook was aggressive against those fighters. Against Porter, Brook was just there to keep him from throwing punches, and it awful to look at. Horn has a notable 12 round unanimous decision win over former eight division world champion Manny Pacquiao in July 2017 in Brisbane, Australia. A lot of boxing fans saw that as a royal mugging on the Australian Horn’s part, as he roughed the smaller Pacquiao up for 12 rounds, and ended up winning a controversial decision in front of his Australian boxing fans at the Suncorp Stadium. The referee Mark Nelson that worked that fight failed to take points away from Horn for all the roughhouse moves he was doing in the match. The fight resembled a boxer facing a ruby player. Horn was constantly slamming to Pacquiao head first like a giant goat, and he cut him up badly. Pacquiao looked helpless, and was constantly looking at the referee to see if he’d take charge of the fight to stop the roughhouse tactics from Horn. The win over Pacquiao is Horn’s only win over a talented fighter. Last summer, Horn was stopped in the 9th round by fellow Top Rank fighter Terence Crawford at the MGM Grand in Las Vegas, Nevada. Crawford was wise not to make the same mistake that Pacquiao did in fighting Horn in Australia. It’s unclear why Top Rank had Pacquiao fight Horn in Australia and not Crawford. That was an odd move on Top Rank’s part, as Pacquiao was a money maker for them, while Crawford hasn’t been a PPV attraction.